The Zen Layout chapter of Using Zen introduces Zen group components as the key to laying out the Zen page. In that chapter, the Groups section describes the simple group components <hgroup>, <vgroup>, <page>, <pane>, and <spacer>. Links link to other Zen pages, or other application content, via a URI. Menus present and manage a structured set of choices, usually links. Navigator creates a navigation interface similar to that found on mobile devices. Tabs define tabbed menus and tabbed forms. Trees provide a hierarchical outline of links that expands or contracts in response to user clicks. Filters allow you to filter the available choices by category. The following table organizes Zen navigation components into two categories: containers (at left) and contained (at right). This chapter describes each component in the order listed in the table. (Any) Provide a link to another page or to a popup message. <link> for each link. <locatorBar> Navigation bar for the top of the page. <locatorLink> for each link in the navigation sequence. <menu> Menu container. The default layout is vertical but you can use the layout attribute to change to horizontal layout. Alternatively, you may use <hmenu> or <vmenu>. <menuSeparator> for the space between options. 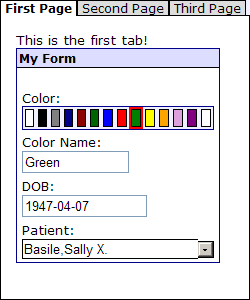 <tabGroup> Traditional set of tabs from which the user can choose one to be displayed on top of the set. <tab> for each option. <lookoutMenu> A tabbed menu that displays a button for each tab. Clicking on a button makes the tab contents display beneath the button. Each tab consists of menu items. <tab> A tab is a group that may contain any combination of components. Inside a <lookoutMenu>, each <tab> contains <menuItem> and <menuSeparator> components. <expando> Expanding and contracting group which may contain any combination of components. For a simple navigation tree, you can provide <link> components within <expando>. <dynaTree> Expandable tree of links. Generated links. These either use the data within the global or are supplied by the callback. <dynaTree> is not a group and does not contain other components. <buttonView> Set of links that permits filtering according to categories. Buttons laid out in a grid according to the number of columns specified. <buttonView> is not a group and does not contain other components. The following figure lists most of the components described in this chapter. All of the classes shown in the diagram are in the package %ZEN.Component, for example %ZEN.Component.tab. The diagram shows the inheritance relationships for these classes. It also highlights which of these components can contain other components, by showing which components inherit from %ZEN.Component.group. Text for this link in the Zen page display. The caption value can be a literal string, or it can contain a Zen #()# runtime expression. If true, this link is disabled. The default is false. A newly disabled link is redisplayed, without an anchor tag, to ensure that it is truly disabled from the user’s point of view. The href value can be a literal string, or it can contain a Zen #()# runtime expression. The onclick event handler for the link. Zen invokes this handler when the user clicks on the link. See Zen Component Event Handlers. If onclick is specified, href is ignored. If onclick is not specified, the link displays the content specified by href. Help message to display when the user hovers the cursor over the link, without clicking. The title value can be a literal string, or it can contain a Zen #()# runtime expression. One way to use <link> is to place it within an <expando> component to present a tree-style menu of links. A <locatorBar> looks like the following example, based on the class ZENDemo.ActiveGroupDemo in the SAMPLES namespace. The <locatorBar> is the horizontal bar along the top of the illustration. The caption for each <locatorLink> is enclosed in square brackets and is separated by a right angle bracket from the next <locatorLink> in the sequence, from left to right. The user can display the title as a tooltip. At the far right end of the bar is the drop-down list of quick links that this <locatorBar> has established by identifying an OnGetQuickLinks callback. The illustration shows that the user is hovering the cursor over this list and is about to make a selection. Doing so would cause the page identified by that link to display. Name of a server-side callback method in the Zen page class. This method provides HTML content for the locator bar using &html<> syntax or WRITE commands. To use the above method as the callback, the developer would set OnDrawBar="DrawBar" for the <locatorBar>. OnGetQuickLinks Name of a server-side callback method in the Zen page class. This method defines a set of quick links to appear as a Go to drop-down list at the top right of the locator bar. For details, see the discussion following this table. seed Allows you to pass some arbitrary value to the OnDrawBar callback. The seed value can be a literal string, or it can contain a Zen #()# runtime expression. The OnGetQuickLinks attribute provides the name of a server-side callback method in the Zen page class. This method must fill the array that is provided to it. If the method constructs a valid array, Zen displays each entry in the array as a Go to drop-down list at the top right of the locator bar. Zen invokes this method whenever it draws the locator bar, automatically passing in its single output parameter, an array subscripted by link caption. The callback must return a %Status value. The following example shows a valid method signature and use of parameters. It generates the quick links shown in the illustration at the beginning of this topic. To use the following method as the callback, the developer would set OnGetQuickLinks="GetLinks" for the <locatorBar>. Set pLinks("Expense Calculator") = "ZENDemo.ExpenseCalculator.cls"
Set pLinks("MVC Master Detail") = "ZENMVC.MVCMasterDetail.cls"
Set pLinks("MVC Chart") = "ZENMVC.MVCChart.cls"
Set pLinks("MVC Meters") = "ZENMVC.MVCMeters.cls"
Set pLinks("MVC Form") = "ZENMVC.MVCForm.cls"
Set pLinks("Test Suite") = "ZENTest.HomePage.cls"
id This value can be used to select a CSS style definition for the <locatorLink>. name Component name. Typically, this is not used for <locatorLink>. Text for this link in the <locatorBar>. A vertical menu, expanded to three levels, looks like the following example, based on the class ZENTest.MenuTest in the SAMPLES namespace. 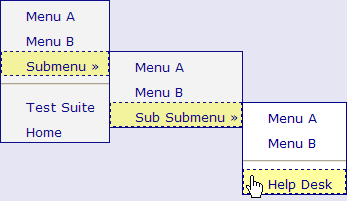 Any options that produce submenus use the » right angle quote to indicate this, as shown for Submenu and Sub Submenu. A <menu> can contain a <menu>. If so, the contained <menu> becomes a submenu and its caption is listed in sequence along with any <menuItem> components at the same level. The above example provides three levels of <menu>. The example provides a <menuSeparator> on the first- and third-level menus. Note how the <menuSeparator> component generates the divider bar between Submenu and Test Suite and between Sub Submenu and Help Desk in the output. The Client Side Menu Components chapter in Developing Zen Applications describes more sophisticated menu components that are more easily fine-tuned and customized. Try the components in this chapter first, and if they do not suit your needs, consult the other book. Each item on a <menu> is defined using <menuItem>. <menuItem> has the following attributes. Since either of them may display their caption or image as a choice within a menu cell, <menuItem> and <menu> share all of these attributes in common. <menu> has additional attributes. For descriptions, see the <menu> section. Text for this menu item when it appears as a choice within its containing <menu>. If true, this menu item is disabled. The default is false. The help attribute supplies help text for this menu item. Generally what you want in place of help is the title attribute. title supplies tooltip text that displays whenever the user hovers the mouse over this item. All Zen components, including <menu> and <menuItem>, support the title attribute. 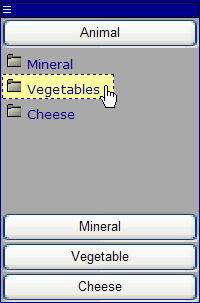 Identifies the pathname and filename of an image to display for this menu item. If both image and caption are provided, they appear side by side, the image at left and the text at right. imageHeight If an image is provided, imageHeight is its height in pixels. The default is 16.
imageWidth If an image is provided, imageWidth is its width in pixels. The default is 16.
linkResource Name of a Caché resource. The user must have privileges to access this resource or this menu item becomes disabled. If you are not familiar with Caché resources, see the Assets and Resources chapter in the Caché Security Administration Guide. The onclick event handler for the menu item. Zen invokes this handler when the user clicks on the menu item. See Zen Component Event Handlers. If onclick is specified, link is ignored. If onclick is not specified, the menu item displays the content specified by link. 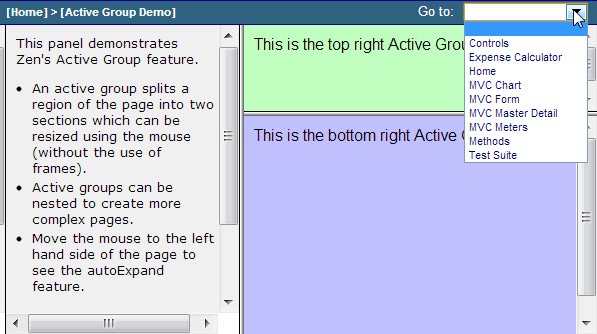 Zen group attributes A menu has the same style and layout attributes as any Zen group. For descriptions, see Group Layout and Style Attributes in the Zen Layout chapter of Using Zen. However, the layout attribute does not apply to <hmenu> or <vmenu> because these components have layout set to "horizontal" and "vertical" respectively. Zen menu cell attributes A menu may display its caption or image as a choice within a menu cell. For this reason, <menu>, <hmenu>, and <vmenu> share several attributes in common with <menuItem>. For descriptions, see the <menuItem> section. The onactivate event handler for the menu. See Zen Component Event Handlers. Used if this menu is a submenu. Zen invokes this handler just before the submenu is made visible. ongetdata The ongetdata event handler. If it is defined, this event returns an array of items to be displayed in the menu. onselect The onselect event handler. If it is defined, this event is fired when the user clicks on an item in the menu. selectedIndex The currently selected item. This is a string of the form 'index1,index2,index3', where each index is the 0-based ordinal position of a menu, and its first and second level children. <accordionMenu> does not support more than three levels. style An additional style to apply to items in the menu. You can get data to populate the <accordionMenu> either from an ongetdata event handler, or by using the controllerId property to connect the menu to an <altJSONProvider>. The following code samples show a simple <accordionMenu> that uses an <altJSONProvider> which gets data from an OnGetArray callback method. key  A value that identifies the selected menu item. Available to the onselect event handler. caption  Supplies text that appears in the menu item. action  A value that identifies the action to take when the user selects a menu item. Available to the onselect event handler. targetId  A value that identifies the object of the action. Available to the onselect event handler. image  Supplies the path to an image that appears in the menu item. children  An array of menu nodes that describe the submenu for a menu item. <accordionMenu> passes the values provided for key, action, and targetId to the onselect event handler. The following simple example illustrates the availability of these values in the event handler. The text provided in the caption property appears as a label for the menu item. The image file supplied by the image property appears as part of the menu item label, to the left of the text. You do not generally need to specify the children property, as it is filled in by the <altJSONProvider> based on subscripts in the pData array provided by the OnGetArray callback. The <navigator> component creates a combination navigation and simple settings interface similar to that found on mobile devices. This is an HTML5 component. It works correctly only on HTML5 compliant browsers. The <navigator> component is implemented by the %ZEN.Component.navigator class. The top-level of the control is initially visible. The top-level is initially hidden and has to be made visible by a user event, such as pressing on an icon to make it appear. Zen group attributes A menu has the same style and layout attributes as any Zen group. For descriptions, see Group Layout and Style Attributes in the Zen Layout chapter of Using Zen. Style to apply to the navigator background. Width of columns (in pixels). The default value is 320, which is also the value that gives the best visual results. Width in pixels of the disclosure bar on the left. The attribute showDisclosure controls visibility of the disclosure bar. Clicking on the disclosure bar expands and contracts the navigator. If true, then show the navigator. If false, the navigator is contracted, and not visible. The default value is true. Height of the footer (in pixels). Set to 0 for no footer. The default value is 0. A value of 40 shows the footer with the best visual results. Height of the header (in pixels). The default value is 40, which is also the value that gives the best visual results. The onarrange event handler. See Zen Component Event Handlers. Zen invokes this handler when the order of items in the current sheet has changed. This event is passed 3 arguments: key, swap, and final. final is true when a value is finished changing. swap is an object with the property index and newIndex, containing the index of the item to move and its new location. The onbuttonclick event handler. Zen invokes this handler when the user has clicks on a "header" or "footer" button. The onchange event handler. Zen invokes this handler when a control within the property sheet has changed value. This event is passed 3 arguments: key, value, and final. final is true when a value is finished changing (such as when the user stops pressing a stepper button). The onclosebuttonclick event handler. Zen invokes this handler when the user clicks on a "close" button for an item. The onexpand event handler. Zen invokes this handler when the user expands or contracts this component. title  the title to display for the sheet. url  if defined, the url to display as an iframe in the sheet (in the same domain). html  custom html to display within the sheet. childIndex  index number (0-based) of child of this component to display. The onindent event handler. Zen invokes this handler when the indentation level of an item in the current sheet has changed. This event is passed 3 arguments: key, list, and final. final is true when a value is finished changing. list is a an array containing the new ordinal positions of the items. The onpopupaction event handler. Zen invokes this handler when the user has invoked and applied a popup for an item. The onselect event handler. Zen invokes this handler when a new choice has been selected within the property sheet. This handler is also called when a "drill" item is selected. This event is passed 3 arguments: key, value, and which. The value of which is "select" or "drill". If true, show the disclosure bar on the left. The attribute disclosureWidth controls width of the disclosure bar. You can also programmatically set the header height using the navigator's setHeight method, which also readjusts any internal geometry. You can use the columnWidth attribute to control the width of the navigator. However, be aware that the navigator is designed for a fixed width of 320 pixels. The layout of menu controls does not display well at other widths. You can use the expanded attribute to hide the navigator by completely collapsing it into a thin strip. The navigator defines an onexpand event that fires whenever the navigator is expanded or contracted. You can use this event to adjust the layout of other controls on the page when the navigator changes size. The key to adding content is the ongetcontent event handler, which is called whenever the navigator needs to get content to display. It is important to understand the stack-based nature of the navigator. You can think of the navigator as being a stack of playing cards. The navigator initially displays one card, and the ongetcontent event handler is called to get content for that card. If the user drills down into an item in the navigator, then a new card is placed on top of the previous card and ongetcontent is called again to get the contents of the new card. The user may then go back to the previous card or drill down yet another level. key  the programmer-defined identifier for the current sheet. This is always ''for the initial sheet. title is the title that is displayed within the banner of the navigator. items is an array of items to display on the sheet. key is '' for the initial sheet. This example returns 3 items in the items array. Each item is an object with certain properties in it, in this case display, which specifies what to display and caption, the caption to display for each item. When the user clicks on an item in the navigator, the onselect action fires and passes along the key value. 'select'  fire the onselect callback. 'drill'  drill down one level. 'link'  navigate to a new URL, value supplies the URL. 'apply'  apply the value of the current item, which causes the navigator's onchange handler to fire. The navigator now displays Gray as an option, with a drill-down icon. If we click on Gray, a new sheet appears on the navigator. Now when the user selects an item, the color of the page changes, assuming that the value of key is a valid color value. The call to popSheet(), restores the navigator to its first sheet (keep popping until the stack level is back to 0). 'caption-value-vt'  display the caption and value laid out vertically. 'caption-value-hz'  display the caption and value laid out horizontally. 'value'  display the item value Note that if the caption or value are too long, they are truncated. 'image-caption-value-vt'  display an image and the caption and value laid out vertically. 'image-caption-value-hz'  display an image and the caption and value laid out horizontally. If image is not defined, a default image is used. If you do not want an image, but want the same indent as if there were an image, then use image:'none'. style  CSS style applied to the overall item (typically background). captionStyle  CSS style applied to the item caption. valueStyle  CSS style applied to the item value. disabled  if defined and true, then this item is disabled. selected  if defined and true, then display this item with the style defined for selected items. 'slider'  display a slider control. minValue and maxValue can be used to define the range. 'slider-toggle'  display a slider control with a checkbox. If the checkbox is turned off the value is set to "". 'stepper'  display a up/down stepper control. minValue and maxValue can be used to define the range. 'stepper-value'  display a stepper with a value. 'switch'  display an on/off switch. 'choice'  display a small set of choices as buttons. valueList and displayList define the set of values and labels. This only works well for a small set of small choices due to the geometry of the navigator. Set the value of the display property to something that displays a value, 'caption-value-hz' is a good choice. Set the value of the edit property to one of the available control types. Note that the action property is ignored if you define an edit property. value is the initial value of the control. It is not updated. You need to define an onchange callback to apply any changes and then make sure these values are used when the ongetcontent handler is next called. The onchange callback is passed 3 arguments: the key value for the item that has changed, the new value, and a final flag. The final flag is true if the value is done changing, and is relevant to sliders and steppers. It lets you track changes as they occur, or wait until they are complete. For each of these items, the action is 'apply’. When the user selects an option the onchange handler for the navigator is called and the sheet is popped off the stack. Note the use of selected to indicate the current value. The onchange handler updates the property party, so that when the original sheet is displayed, it shows the user's choice. The html content fires data change events by invoking the navigator's applyValue method. This fires the onchange handler using the key value for the entire panel, which in this case is 'custom'. The <toolbar> component is a versatile component that can display a series of different items along a horizontal bar. This is an HTML5 component. It works correctly only on HTML5 compliant browsers. The <toolbar> component is implemented by the %ZEN.Component.toolbar class. imageStyle Additional style to apply to images in the menu. Use this to change the size of images. onchange onchange event handler. Provides notification that a control in the toolbar has changed value. This event is passed the following arguments: key, value, and final. final is true when a value is finished changing. ongetdata ongetdata event handler. If defined, this event returns an array of items to be displayed in the menu. onpagechange onpagechange event handler. If defined, this event is fired when the user selects a new page number from a "pages" item. This event is passed the following arguments: key and page (selected page, 1-based). from the data element associated with the menu choice. onselect onselect event handler. If defined, this event is fired when the user clicks on a item in the menu. This event is passed the following arguments: key, action, and targetId from the data element associated with the menu choice. scrollOffset The index (0-based) of the first top-level item to be display when scrolled. selectedIndex The index (0-based) of the selected item in the top-level menu. style Additional style to apply to items in the menu. "item"  show a menu item. This is a caption that the user can click. An "item" may also define a list of children that are displayed as a drop-down menu. Clicking on an item raises the onselect event. "tab"  show a "tab". This is a caption that the user can click. When the user clicks a tab, it becomes the current tab and all other tab items are unselected. Clicking on a tab raises the onselect event. "message"  display a text message. "choice"  display a set of choices (using a displayList and valueList) as a choice button. "pages"  display a set of paging buttons, such as may be present on a search results page. In this case you can specify the minValue (first page #), maxValue (last page #) and value (current page). Clicking on a page invokes the onchangepage event. A <tabGroup> displays a set of <tab> components. It can only display one <tab> at a time. The user can choose one of these tabs to be displayed on top of the set. A <tabGroup> looks like the following example, based on the class ZENTest.TabTest in the SAMPLES namespace. 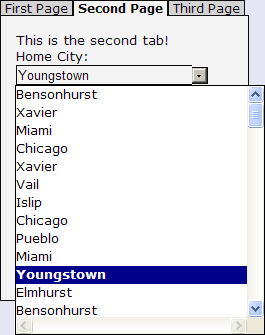 In the above example, the user has clicked the tab labelled First Page. In the following example, the user has clicked the tab labelled Second Page and has clicked the down-arrow to select a Home City option from the <dataCombo> control. cellStyle="padding: 2px; padding-left: 5px; padding-right: 5px;"
<titleBox title="My Form" titleStyle="background: #DDDDFF;"
<colorPicker title="This is a custom control!" <text label="DOB:" id="DOB" name="DOB" size="15"
<dataCombo label="Home City:" name="City" size="24"
When a <tabGroup> has contents that do not fit within its defined height or width, Zen clips the display of excess content at the right and bottom edges of the defined <tabGroup> size, leaving room for a horizontal or vertical scrollbar that allows the user to scroll to view the contents. Application and page level stylesheets can override this default behavior by applying the CSS property overflow to the element class tabGroupBody. <tabGroup> has the following attributes. Since either <tabGroup> or <lookoutMenu> may display <tab> components, both <tabGroup> and <lookoutMenu> share these attributes. <lookoutMenu> has additional attributes. For descriptions, see the <lookoutMenu> section. Zen group attributes <tabGroup> and <lookoutMenu> each have the same style and layout attributes as any Zen group. For descriptions, see Group Layout and Style Attributes in the Zen Layout chapter of Using Zen. For <tabGroup>, the height attribute has no effect; it is necessary to control the height of the <tabGroup> from the CSS stylesheet. 1based sequential number of the tab currently displayed. The default is 1. The currTab value may contain Zen #()# runtime expressions. If true, remember the most recently displayed tab number in a session cookie and return to this tab when redisplayed. The default is false. If true, display the set of tabs that belong to this <tabGroup>. By setting showBody to false, and setting showTabBar true, you can display a set of tab bar buttons with no tab contents underneath. The default for showBody is true, and for showTabBar is false. If true, display a set of tab buttons along the top of this group. The default is false. A <lookoutMenu> presents a stack of buttons, one for each tab. Clicking on a button shifts the other buttons down so that they display below the contents of the currently selected tab. The following example is based on the class ZENTest.LookoutMenuTest in the SAMPLES namespace. In the illustration, the user has clicked the Animal button to reveal the contents of that tab. This selection moved the remaining buttons to the bottom of the lookout menu. The cursor is now on the Vegetables menu item. If the user clicks this item, the content of its link is activated as defined in the corresponding <menuItem>. A <lookoutMenu> contains a set of <tab> components, which in turn contain <menuItem> and <menuSeparator> components. These tabs are groups that can contain any component, but when they are present inside a <lookoutMenu> they contain the components that would normally define a <menu>. 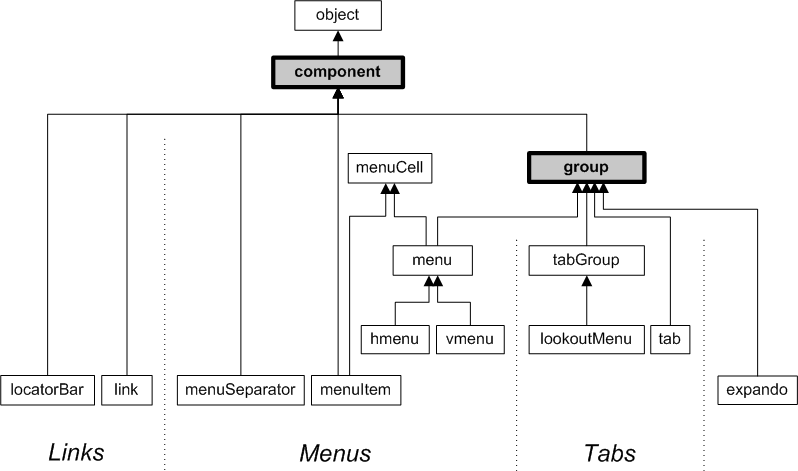 Zen tab group attributes <lookoutMenu> has the same general-purpose attributes as <tabGroup>. For descriptions, see the Tab Group Attributes table in the <tabGroup> section. If true, this <lookoutMenu> group is expandable. The default is false. When expandable is true, an expansion bar displays along the top of the <lookoutMenu> as shown in the illustration above. The user clicks on this bar to toggle the expanded state of the <lookoutMenu>. When the menu is contracted, only the expansion bar is visible. The user clicks the bar again to expand the <lookoutMenu>. If true, this <lookoutMenu> group is expanded (children visible). If false, it is contracted (children not visible). The default is true. <tab> has the same style and layout attributes as any Zen group. For descriptions, see Group Layout and Style Attributes in the Zen Layout chapter of Using Zen. A <tabGroup> or <lookoutMenu> uses the hidden attribute to make the current tab visible and all other tabs invisible. That is, when a <tabGroup> or <lookoutMenu> is displayed, it sets the hidden attribute for the currently visible <tab> to false and sets all the others to true. For this reason, explicitly setting hidden for a <tab> element has no effect. If you need to prevent users from accessing a <tab> you can set its disabled attribute to true. Text for this tab when it appears as a choice within its containing <tabGroup> or <lookoutMenu>. An optional URI value. If defined, the tab displayed within the <tabGroup> bar becomes a link referring to this URI. No link is displayed for the current tab. The link value may contain Zen #()# runtime expressions. tabResource Name of a Caché resource. The user must have privileges to access this resource or this tab becomes disabled. If you are not familiar with Caché resources, see the Assets and Resources chapter in the Caché Security Administration Guide. The <expando> is a group with the ability to show or hide its children. A right-arrow graphic ( ) beside the <expando> label indicates that the group is expanded (displayed), and a down-arrow graphic ( ) indicates that the group is contracted (hidden). A fully contracted <expando> group looks like the following example. The user expands the group by clicking on its label. The contents of the <expando> then display below the label. As a Zen group, an <expando> may contain any type of Zen component. In particular, each level of the <expando> may contain additional, nested <expando> groups that can be expanded or contracted independently of the containing <expando> group. In the following example, the user has just clicked on the label to expand the group. The cursor is now poised to contract the <expando> by clicking the label again. This example contains three nested <expando> groups. The innermost <expando> uses a horizontal layout, and contains <button> components instead of <titleBox> components as in the other levels. <expando caption="Graham Stuart Thomas" OnDrawContent="DrawContent"
<expando caption="Three Gardens of Pleasant Flowers"
<titleBox title="The Art of Planting"
Zen group attributes <expando> has the same style and layout attributes as any Zen group. For descriptions, see Group Layout and Style Attributes in the Zen Layout chapter of Using Zen. The default layout for <expando> is vertical. If true, Zen animates the appearance and disappearance of the <expando> group contents. If false, it does not. Text to display as the title of this <expando> group. This text displays even when the <expando> is contracted. This text is not automatically HTML escaped. childIndent HTML length value giving the amount to indent the children in the expanded list of items. The above example uses 35px. The default is to use no indentation, aligning the children with the caption. If true, this <expando> group is expanded (children visible). If false, it is contracted (children not visible). The default is true. If true, display a border around the entire group and display the caption within a more formal title box. This more formal version of the <expando> component is also known as a disclosure. The default is false. The %ZEN.Component.expando class offers a server-side callback method %OnDrawTitleOptions which, if defined in a subclass of %ZEN.Component.expando, provides a way to add content to the right side of the title bar when framed is true. Any HTML written by %OnDrawTitleOptions is injected into the title bar when the <expando> is displayed. URI of the image to display when the <expando> group is contracted. The path that you provide for imageContracted must be relative to the CSP directory in the Caché installation directory. The default for imageContracted is a right-arrow graphic ( ) located at the URI broker/images/disclosure-contracted.gif. URI of the image to display when the <expando> group is expanded. The path that you provide for imageExpanded must be relative to the CSP directory in the Caché installation directory. The default for imageExpanded is a down-arrow graphic ( ) located at the URI broker/images/disclosure-expanded.gif. Name of a server-side callback method in the Zen page class. This method injects HTML content into the <expando> using &html<> syntax or WRITE commands. To use the above method as the callback, the developer would set OnDrawContent="DrawMe" for the <expando>. If true, remember the most recent expanded state in a session cookie and return to this state when redisplayed. The default is false. <expando> can be particularly useful in navigation when combined with <link>. 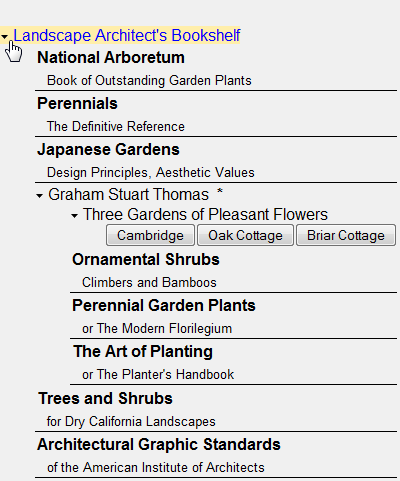 Use the dataGlobal attribute to specify a global whose data supplies the contents of the tree. Use the OnGetNodeInfo callback to get data for each node within the tree. Use the OnGetTreeInfo callback to fill in a local array that supplies the contents of the tree. Note that <dynaTree> builds the tree from the root of the global or array. It does not support starting the tree from a node other than the base node. The simplest way to define a <dynaTree> is to use a Caché global (multidimensional array). For background information about globals, refer to the book Using Caché Globals. This definition causes the contents of the ^myTree global to be displayed on the page as nodes within an expandable tree. Set ^myTree("Root","Item 1") = "ZENMVC.MVCForm.cls"
Set ^myTree("Root","Item 2") = "http://www.intersystems.com"
Set ^myTree("Root","Item 2","SubItem") = "ZENDemo.Home.cls"
Each global node now has one or more subscripts, such as "Root" or "Item 2". Zen uses these subscripts as the display values for nodes in the <dynaTree>. The logical value for each node is the value of the global at that subscript. Our ^myTree global can now generate a <dynaTree> that looks like the following illustration. This <dynaTree> is fully expanded, with the user holding the cursor over the node "SubItem" at the lowest level. Based on the previous SET statements, the logical value for this node is "ZENDemo.Home.cls" and its display value is "SubItem"
When you use a global to define a <dynaTree>, the resulting nodes always appear in alphabetical order (by label) because that is the way globals are organized in the database. Or the URI of some other content. OnGetNodeInfo to get data for each node within the tree. OnGetTreeInfo to fill in a local array that supplies the contents of the tree. paramName The paramName must be unique within the <dynaTree>. It becomes a subscript in the array of parameters passed to the callback method. value The value supplied for a <parameter> can be a literal string, or it can contain a Zen #()# runtime expression. This example defines a tree whose nodes are provided by the server-side callback method GetNodeInfo. When the user clicks on an item, the treeClick method is called. The example also provides two parameters for the GetNodeInfo method. A tree contains a set of top-level nodes at level 1. A node may contain child nodes; each child is considered to have a level number one greater than its parent: 2, 3, 4, etc. Starting with level 1, Zen calls the OnGetNodeInfo callback repeatedly until it returns false, indicating that there are no more nodes at the current level. If a node reports that it has child nodes, Zen calls the OnGetNodeInfo callback repeatedly (with the appropriate value for pLevel) to get information on each child node until false is returned for that child level. The method returns a %Boolean value indicating whether or not there is a node at the level indicated by pLevel. tSC is a status code, returned by reference, that indicates success. pParms represents any <parameter> elements defined by the <dynaTree>. pParms is an array. Each member of this array uses its paramName as a subscript and its value as a value. pLevel is the current level of the tree. pHandle is user-definable value that is passed, unchanged, to each call to the callback. The callback can use this store any state information it needs while providing the view information. pNodeInfo is a pre-instantiated %ZEN.Auxiliary.NodeInfo object and is used to specify how the tree node should be displayed. A %ZEN.Auxiliary.NodeInfo object has the following properties. If true, this node (if it has children) is initially displayed as expanded. If false, it is initially displayed as contracted. The default is true. expanded has the underlying data type %ZEN.Datatype.boolean. See Zen Attribute Data Types. It has the value 1 or 0 in server-side code, true or false in client-side code. If true, this node has one or more child nodes. If this is the case, the next call to the OnGetNodeInfo callback fetches information about these child nodes. The default is true. hasChildren has the underlying data type %ZEN.Datatype.boolean. See Zen Attribute Data Types. It has the value 1 or 0 in server-side code, true or false in client-side code. text A string containing a value to display for this node within the tree. value A string containing a logical value to associate with this node within the tree. The following code example provides a complete OnGetNodeInfo method. // unchanged, to each call to the callback. // In the beginning: pHandle = ""
// ...and also subnode for the 6th subnode of the 3rd node. The method returns a status code. pRoot is the display name of the node to be loaded. The previous example defines a <dynaTree> whose data is provided by the server-side callback method GetTreeInfo. When the user clicks on an item, the treeClick method is called with the value 20 in its parameter array subscripted by the key "count". If you use OnGetTreeInfo to define the <dynaTree> this excludes using the OnGetNodeInfo or dataGlobal attributes in the same <dynaTree>. The following example implements GetTreeInfo from the previous example. This shows the required method signature for an OnGetTreeInfo callback. For further examples, see the class ZENTest.DynaTreeTest in the SAMPLES namespace. In that example there are several different OnGetTreeInfo callbacks. The user clicks a radio button to choose which of these callbacks is used to generate the <dynaTree> on this page. The <dynaTree> component is the XML projection of the %ZEN.Component.dynaTree class. This topic has already described the dataGlobal, OnGetNodeInfo, and OnGetTreeInfo attributes in detail. The following table lists all the <dynaTree> attributes. The purpose of many <dynaTree> attributes is to configure the images that the user clicks to control expansion and contraction. The following diagram shows many of the images that the <dynaTree> displays while the component is in use. The following table describes how to configure these images, if you wish to substitute your own images instead. HTML length value giving the amount by which each level within the dynaTree should be indented. The default is to use no indentation. childIndent applies only when showLines is false. When showLines is true, indentation is controlled by the <dynaTree> to fit the lines that it provides. Using dataGlobal excludes OnGetNodeInfo. For details, see the section <dynaTree> Using a Global in this chapter. File name for the image to display when the <dynaTree> is contracted. The user clicks on this image to expand the group. The default for imageContracted is the plus sign whose file name is contracted.gif. You may specify an alternate image. The image file that you identify must reside in the images directory under the Caché installation directory. imageContracted applies only when showLines is false. When showLines is true, a plus sign automatically appears as part of the graphical image that displays the lines. File name for the image to display when the <dynaTree> is expanded. The user clicks on this image to contract the group. The default for imageExpanded is the minus sign whose file name is expanded.gif. imageExpanded applies only when showLines is false. When showLines is true, a minus sign automatically appears as part of the graphical image that displays the lines. File name for the image to display beside a closed folder node. This is a node that has children but is currently closed (contracted). The user clicks on this image to expand the node. The default for imageFolderClosed is a closed folder icon whose file name is folderclosed.gif. File name for the image to display beside an open folder node. This is a node that has children and is currently open (expanded). The user clicks on this image to contract the node. The default for imageFolderOpen is an open folder icon whose file name is folderopen.gif. File name for the image to display beside a leaf node. This is a node with no children in the <dynaTree>. The user clicks on this image to select the node. The default for imageNode is a file icon whose file name is node.gif. If true, show dashed lines between the nodes of the tree. The default is false. OnGetNodeInfo Name of a server-side callback method that reports information about each node within the tree. Using OnGetNodeInfo excludes dataGlobal. For details, see the section <dynaTree> Using an OnGetNodeInfo Callback in this chapter. OnGetTreeInfo Name of a server-side callback method that fills in a local array that supplies the contents of the tree. Using OnGetTreeInfo excludes both OnGetNodeInfo and dataGlobal. For details, see the section <dynaTree> Using an OnGetTreeInfo Callback in this chapter. selectedIndex 0-based index of the currently selected node in the <dynaTree>. The default selectedIndex is 1 (nothing is selected). Each <parameter> element provided in the original <dynaTree> definition in XData Contents becomes a member of the dynaTree parameters property, a list collection of %ZEN.Auxiliary.parameter objects. Each <parameter> acquires an ordinal position in the parameters collection: 1, 2, 3, etc. The read-only text property holds the text (display) value of the currently selected node within the tree. This is the node label that displays in the <dynaTree>. The read-only value property holds the logical (actual) value of the currently selected node within the tree. This is the string that is activated when the user clicks the corresponding label in the <dynaTree>. <dynaTree> supports data drag operations when its dragEnabled attribute is set to true. This is possible because each node in a <dynaTree> has a logical value and a display value defined. Data drag is explained in the Data Drag and Drop section in the chapter Zen Controls. Essentially, the user clicks the mouse button down while the cursor is positioned on a <dynaTree> node, then moves the mouse away from the <dynaTree> while still holding down the button. Data drag captures the current value of the <dynaTree> node where the drag operation began. If the logical value and displayed value are different, this difference is preserved when the data is captured. The data acquired from a <dynaTree> node can be dropped on any Zen component that has drop enabled. Generally this is a Zen control. <dynaTree> does not support data drop, as it is not a control and cannot accept data input from the client side. A <buttonView> may contain multiple categories of buttons. Each category works like a set of radio buttons, in that only one button in the category may be selected at any time. In the following example, many more categories in the <buttonView> have been selected. Every <buttonView> component automatically provides a Reset button that is enabled only when the user has made at least one selection. Reset appears as the top left entry in the grid. If clicked, Reset cancels all current user selections in the <buttonView>. Number of columns for the grid. If not specified, the default is 4. The number of rows is determined dynamically depending on the total number of items and the columns value. OnGetButtonInfo Name of a server-side callback method that provides the list of items to display for this component. For details, see the <buttonView> OnGetButtonInfo section following this table. Allows you to pass some arbitrary value to the OnGetButtonInfo callback. The seed value can be a literal string, or it can contain a Zen #()# runtime expression. For suggestions about how to use the <buttonView> seed value, see the <buttonView> OnGetButtonInfo section following this table. A string containing the currently selected value from the component. The user can click the built-in Reset button to empty the value string and start over. The next several topics explain how user selections in this <buttonView> can cause this <html> component to invoke its OnDrawContent method, effectively redrawing the <html> component based on the user’s selections in the <buttonView>. A %String. If you provide a seed value for the <buttonView>, it is automatically passed to the OnGetButtonInfo callback method. An array passed by reference. This array contains an array of button descriptions when the method returns. $LB is shorthand for the ObjectScript function $LISTBUILD. n is the 1based button number. category is the name assigned to the category that contains this button. You must group buttons in the <buttonView> into categories. All buttons with the same category value work together, like a set of radio buttons. When one button in a category is selected, none of the other buttons in that category can be selected. caption is the text that appears on the face of the button. You can use a $$$Text macro to support localization of the caption. tooltip is the text that displays when the user hovers the cursor over the button. The tooltip can also use $$$Text. disabled, if true, disables this button. The button still displays, but is grayed out. Where $I is shorthand for the ObjectScript function $INCREMENT. This automatically invokes the OnDrawContent handler for the <html> component. This callback must be a server-side method defined in the page class. It must accept a %String as input and return a %Status data type. In this case, its name is DrawMyContent. DrawMyContent uses the <html> seed (that is, the <buttonView> value) to determine what to do while redrawing the <html> component. It is up to this method to figure out how to use the filtering information provided by multiple user selections in the <buttonView>. The <buttonView> simply provides a value.